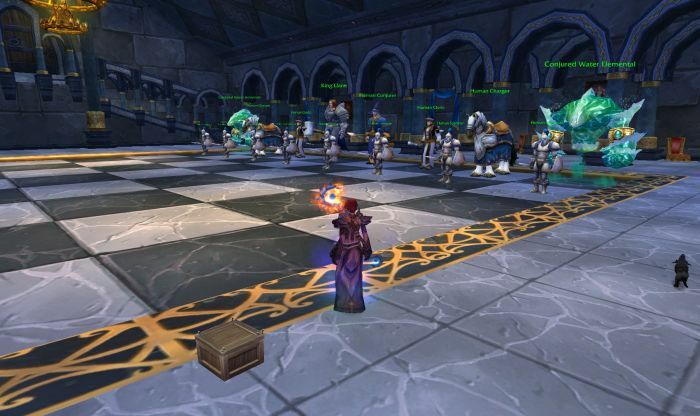 Yeah, I Still Play That “Other” Game Too #WorldofWarcraft #WurmOnline – Nomadic Gamers, eh! When I tell people in other games that I still play (and enjoy) World of Warcraft, they seem to look at me in a different light, a negative one, at that. Suddenly I’ve lost some online points with them. Trying to explain why I continue to play has been my new challenge, and the one point I keep coming back to is that sometimes, I like not having to think. While my heart is forever drawn to those complex sandbox games like EVE and Wurm Online, there are days when I don’t want to have to do anything that requires any thought process what so ever. Where I want simple fun and the quicker I can get it, the better. WoW fills this desire perfectly. I can queue for a raid or a dungeon and be happily killing mobs in no-time. I can quietly harvest, craft, or work on achievements. If I’m in the mood for pvp it’s even simpler, and it’s a lot of fun (personal opinion of course). I think it’s important to play different games, especially if you work in the gaming industry. You don’t want to become so involved that you shut your mind down to other methods of gameplay. You also don’t want to play your game of choice so much that you become bored with it – having other options eases this slightly. So even though I work mainly with Wurm Online, and yes, it is by far my ‘game of choice’ and has been for quite some time now (as is evident on this blog) I do continue to play other games, and will probably continue to do so as long as I game at all. Because I’m not looking to get heavily vested in another game I tend to swerve away from the more time invested ones that everyone else is talking about these days, but I’m sure I’ll pop in eventually. Video games are supposed to be fun. As soon as they’re not, it’s time to stop playing them. As always, happy gaming, no matter where you find yourself! I’ve never understood why some people rage at others for playing games that “aren’t cool.” It’s as if they never left middle school. I still have my Annual Pass, and am content to drop in every so often. Whenever I need a fix of quick gaming, though, I usually go for Tribes: Ascend. WoW never “clicked” for me, but I don’t care that others play it. It’s gotta be doing *something* right to keep so many entertained for so long, after all. I am the same way. Every so often (especially in the spring/summer console game lull) I end up spending 15 bucks and playing WoW for a month. It fills a void, and seems to still be the best choice of that type of MMO due to it having almost a decade worth of content to play. My only real beef with WoW is that asinine Tuesday maintenance. My weekend is Monday/Tuesday so I always lose half a day on my weekend to play. I stopped trying to explain to people why I am playing it, I just tell them cause I feel like it and if they cant accept that then I am not gonna worry about it.